A few weeks ago I received an e-mail from three different people with each person requesting a specific type of workout video. One person wanted a workout video for beginners, another requested a workout that could be done on vacation with little to no exercise equipment, and the third, wanted and example of a no impact workout. I figured I would continue to add to my Bonus Free Workout Video Series with a resistance band workout that would grant all three requests. So, with that quick intro out of the way, here's the free resistance band workout video that is perfect for beginners, if you're on vacation, or if you need some no impact exercise ideas. If you were wondering about the location, I decided to venture a bit outside of the city of Pasadena and shot this video near Dodger Stadium in Los Angeles, California. Once again, one of my clients, Nickii Jean Alex helped me demonstrate some of the exercises. I purposely had her do this workout blind, meaning I didn't have her practice it, so that you can see how easy it is to pick up. Also, keep in mind that the resistance band that I used in the video had no handles. 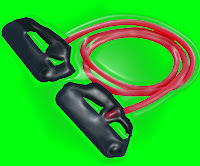 You can use bands with our without, and you can also vary the way you grip the resistance band. It takes a little practice, but you'll easily get the hang of it. The exercises are set up in a complete, full body workout. There's a pushing movement/exercise (Chest, shoulders, triceps). There's a pulling movement/exercise (back, biceps) a lower body exercise and a core movement. If you have any questions on this resistance band workout, my downloadable12 day fat burning and fitness, Fat X Program, or if your need a fitness coach (personal trainer), feel free to contact me via E-mail, on Twitter, or Facebook. I'm here to help you get results, because if you fail, I fail, and I wont let that happen! So if you need help, feel free to contact me.